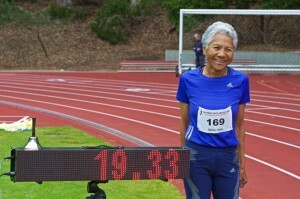 Track and field’s octogenarian superstar, Irene Obera (W81, Fremont, CA), followed up a record-breaking 2014 season with yet another impressive performance in this year’s Pride Meet – which returned to San Francisco State’s Cox Stadium four years after it relocated to Chabot College in Hayward, CA. Irene ran the 80m hurdles in 19.34, which tops her own W80-84 World Record of 19.77 set in Winston-Salem, NC last year at the US Master’s Championships. She followed up this incredible run with a US-list-topping 17.63 in the 100m. In addition to Irene’s (pending) World Master’s Record and chart-topping 100m, 8 athletes posted US Master’s List-leading marks for 2015 – including Joy Upshaw (W54) in both the 200m (17.63) and 300m hurdles (50.60), Dimitry Yakoushkin (M38) in the 110m HH (15.95), Larry Barnum (M71) in the 400m (1:04.43), and Ruth Rainero (W60) in the 1500m (6:19.81). A competitive 5000m race led to three US Master’s List-leading marks: Stella Gibbs (W56) in the 5000m (20:23.76), Lynne Hurrell (W80) in the 5000m (27:29.24), and Mike Holland (M66) in the 5000m (19:58.50). 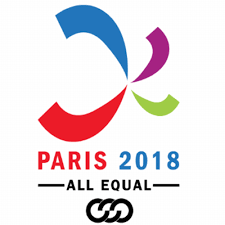 Other notable performances include Pride Meet records by Thomas Setser (M35) in the 1500m (4:41.28), Rod Jett (M48) in the 110m Hurdles (14.95), Eric Surprenant (M25) in the 400m Hurdles (54.44), Daniel Lloyd (M61) in the Shot Put (13.63m), Kris Paaso (W44) in the 800m (2:17.78), Nicole Campbell (W33) in the 1500m (4:56.89), and Katherine Chang (W24) in the Pole Vault (3.35m). Laura Rau (W30) had an incredible debut in posting Meet Records in both the 100m Hurdles (15.89) and Long Jump (6.03m). Check out our Results page on Pride Meet website.